Science doesn’t have to be boring. In fact, science can be exciting. 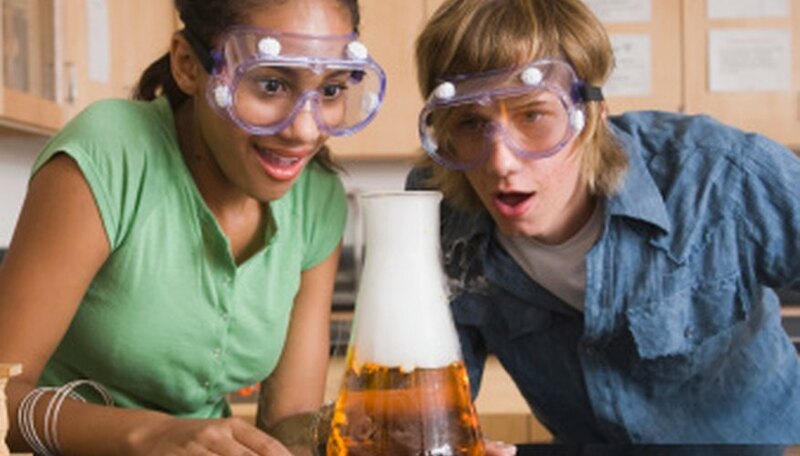 Get your students enthused about science by demonstrating these exploding experiments that will raise their interest and curiosity in science. Exploding jack-o'-lanterns, eggs, marshmallows and potato chip rocket cans are sure to accomplish this. Make sure to be safe when performing these experiments. Elementary and middle school children will learn a lesson about exothermic reactions while participating in the exploding jack-o'-lantern experiment. Before conducting the experiment, have students define an exothermic reaction. Carve a pumpkin. Pour half a cup of six percent hydrogen peroxide, a tablespoon of liquid dish soap and eight drops of food coloring into a soda bottle. Place the bottle inside the pumpkin. In a separate bowl, mix together a small packet of dry yeast and three tablespoons of warm water. Pour the mixture into the bottle. Place the top back on the jack-o'-lantern and stand back. Foam will explode out of the jack-o'-lantern. The yeast will quickly remove the oxygen from the peroxide, creating lots of bubbles filled with oxygen. Middle school through high school children will learn how rockets launch into space while conducting the exploding rocket can experiment. Empty and cut a small hole into both ends of a tall potato chip can. Connect a methane gas tap to a piece of rubber tubing and fill the can full of gas while covering the second hole. Place the can face down on a stand and ensure that students watch from a safe distance. Light the metal end and back away. In approximately one minute the gas and air will cause the potato chip can to launch. Children will learn a lesson on pressure with this experiment. Middle school students can participate by poking a pin hole in both ends of an egg and blowing the insides out. Place the empty egg shell on a stand and fill with hydrogen. Make sure students watch from a safe distance, light the top of the egg and move away. Hydrogen will rise to the top of the egg and air will fill the bottom. The hydrogen ignites, which cause the gasses in the egg to get very hot and expand. The pressure is too high, so the egg explodes. Give elementary students a lesson in physical science with the marshmallow bomb. A microwave excites water molecules in food. The faster the molecules spin the hotter they become. The heat causes the air bubbles in the marshmallow to expand until it blows up. Place a marshmallow on a plate in a microwave oven for one minute. Experiment with several different time settings to see how long it takes for the marshmallow to explode. Lisa King has a Bachelor of Arts in education. She has been writing articles for over 10 years and currently writes for various websites about education and other topics. King specializes in articles that educate parents with special-needs children. King, Lisa. "Exploding Experiments for Kids." Sciencing, https://sciencing.com/exploding-experiments-kids-8538818.html. 25 April 2017.